To attach to the panniers there are fixing hooks which slide onto the top of the pannier. When you lift up the bag, it automatically unlocks these hooks. That is quite ingenious and useful for a quick getaway. 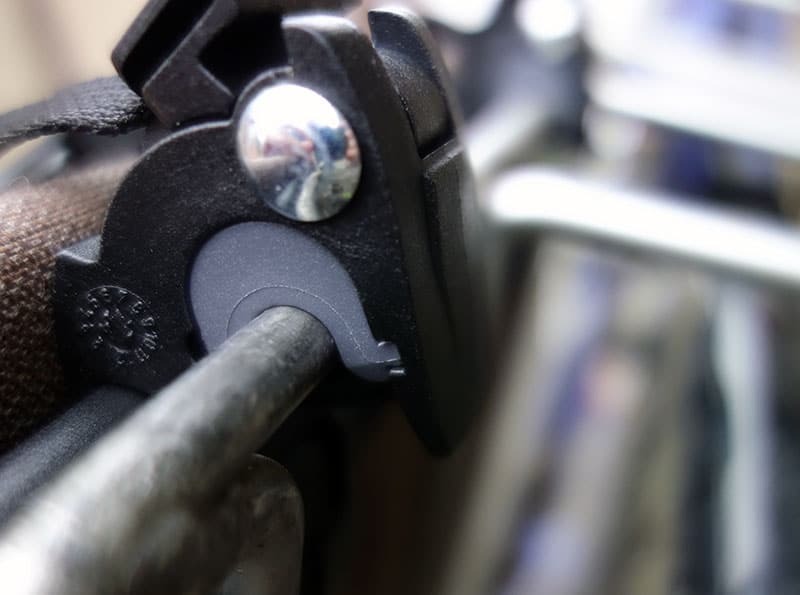 The downside is that sometimes these locks stop the bag sliding onto the pannier in the first place, and you have to make a quick adjustment. 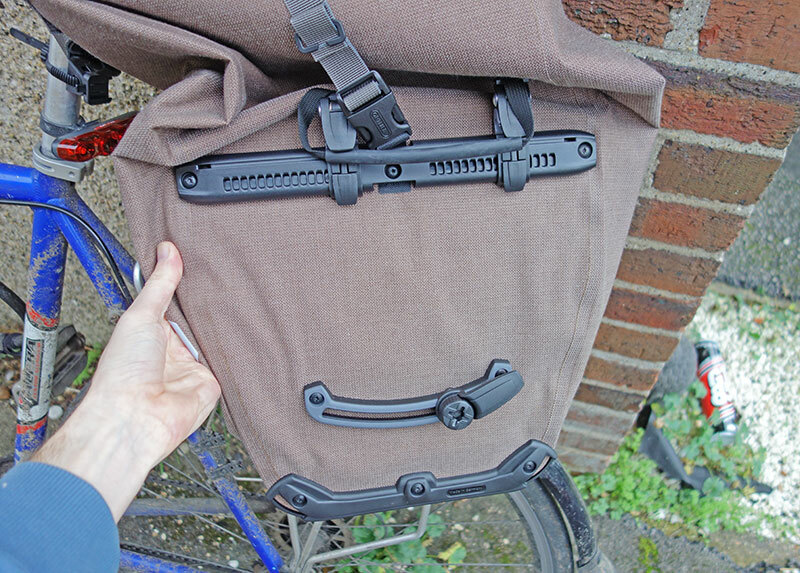 To secure the bag into the panniers on the side there is an adjustable plastic hook. You can adjust this position with your fingers and is a pretty good design. The downside is that I often struggle to get the big plastic hook on the side into the panniers, even though I’ve tried different positions. But, because the top hooks are pretty secure, it doesn’t seem to matter. There is a relatively small shoulder strap. It doesn’t get in the way when not in use, but if you want to carry on shoulder whilst shopping, this is a very useful addition. I really wanted the best of both worlds – rucksack and pannier. I don’t like carrying a heavy bag on my shoulder. So I bought this rucksack converter. 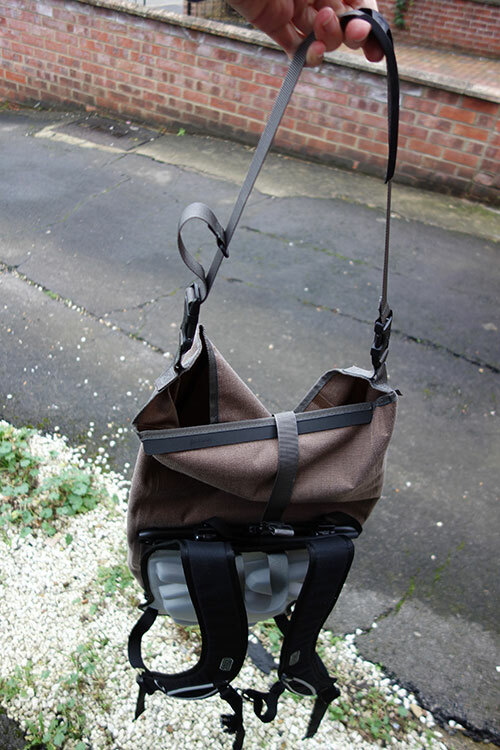 It is relatively quick to click on to the back of the pannier and then it acts like a top heavy rucksack. 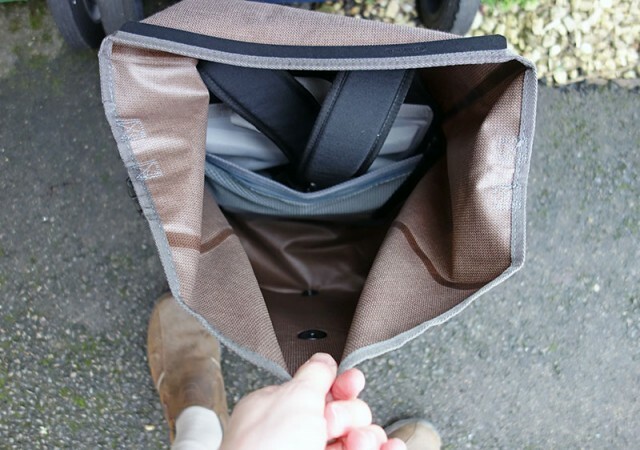 The rucksack adapter is big, it takes up a lot of space in your pannier bag and rather defeats the purpose. If you go into town, you don’t want to spend 3-5 minutes converting into a rucksack. 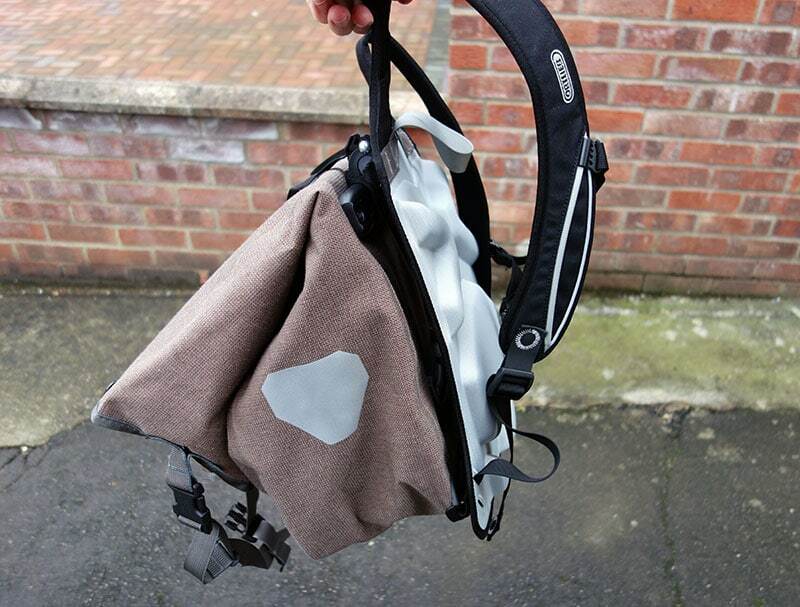 It really is only for those who go touring and want to do a serious walk with their bike pannier on the back. I’m afraid it’s one of those things that seemed like a really good idea, but it will remain unused in garden shed for several years before being given away or even discarded. I just can’t see myself using it now it is. Looks good. 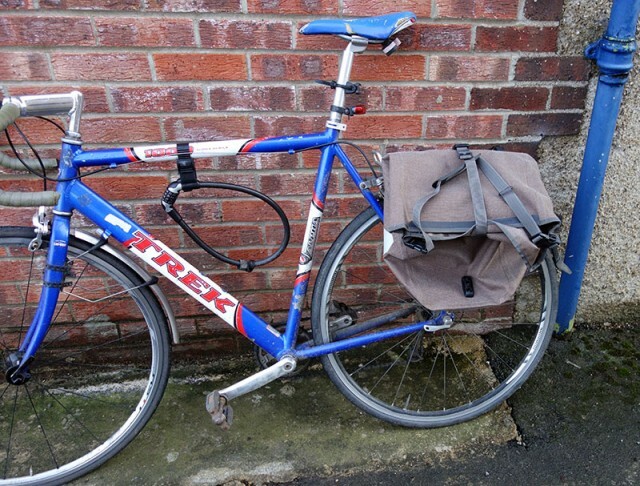 A stylish addition to bike (though it makes me feel I need a new commuting bike, as the bag looks more stylish than my Trek. Waterproofness excellent standard for carrying a laptop. I don’t know what it is like after two hours of rain, because I have no intention of finding out! Shoulder strap makes it easy to carry around. It can be made into rucksack for extra adaption. Quite easy to clean. I was carrying a plant which spilt its compost, but easy to clean out. Despite adjustability of levers. I have found it a little awkward to put on bike panniers. My old pannier was straight on every time. But, something always seems to get caught, so you have to fiddle around. Only minor delay, but I’m often putting bag on and off – several times a day. It looks a little baggy when not full and you have to tie it down to stop the flap flying around. The rucksack adapter is good idea, but in practise I can’t see myself using it. At £65, it’s not cheap. But, it is quite a good pannier. A bit dissappointed I have to faff around a little to get bag on bike, but apart from that it’s good. I would recommend, if you’re looking for a high end pannier. A great blog and I’ve been following for years but rarely comment. I find it easier to put my stuff into a small rucksac and then put that in the pannier. It can be a cheaper option. 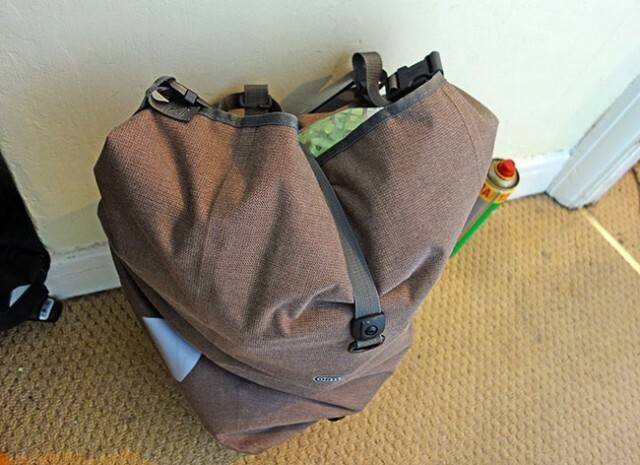 Also if you have to do some shopping on the way home the rucksac goes on your back and the shopping in the pannier. 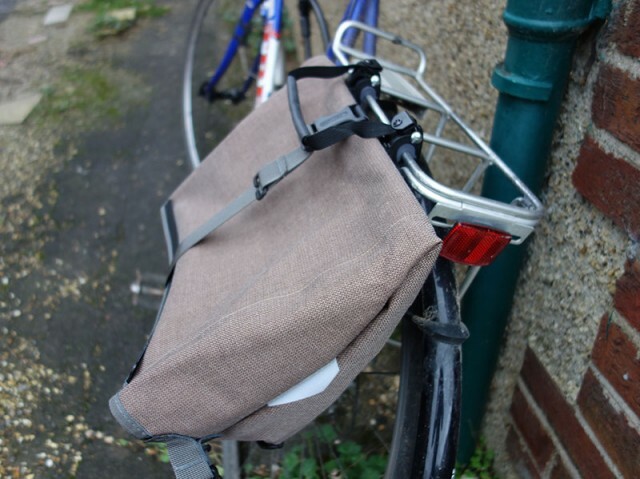 I dont spend a lot on panniers just as long as they are sturdy and waterproofing is a simple case of using a plastic rubble bag as a pannier liner. Good idea! Why didn’t I ever think of that? I could have saved myself £30. Plenty of room for vitamins!